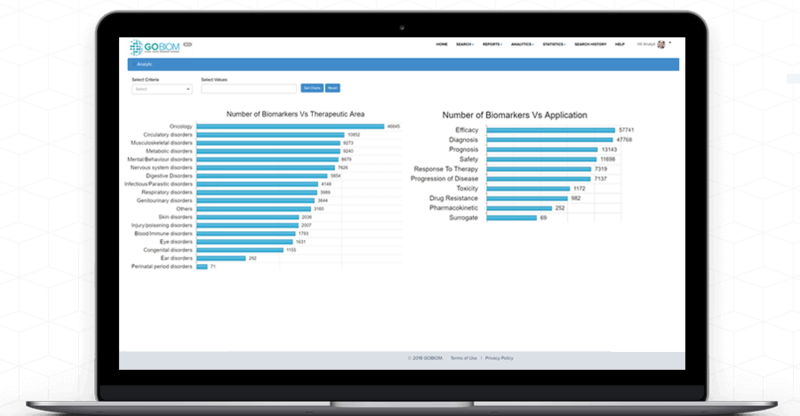 The true value of GOBIOM biomarker database is measured by the critical questions that it can address for the success of the clinical trials and accelerating drug development. Are there any diagnostic biomarkers? Are there any biomarkers to identify disease progression and prognosis? What are the markers linked to efficacy/toxicity of a drug? Are there any biomarkers approved by regulatory authorities? Are there any evidence based clinical practice guidelines issued by professional societies? Is the biomarker translating from preclinical to clinical models? What are the clinical endpoints to which a biomarker is significantly correlated? What is the study population who would be most benefitted by a therapy? How many clinical trials are associated with a given biomarker? What is the biomarker outcome in each trial? What are the approved diagnostics and companion diagnostics for a given biomarker and who are the assay vendors? What are the drug resistance biomarkers reported for a given therapy? Are there any off-label uses of the approved drugs? Biomarkers which indicate the presence or likelihood of a particular disease in patients or in animal models. Biomarkers which can discriminate between patients at high and low risk of a clinical outcome. Biomarkers which can indicate the progression of disease. Biomarkers which correlate with the desired effect of a treatment. Biomarkers predictive of response to a treatment. Markers which substitute a desired clinical outcome and which can be measured months or even years before meaningful clinical endpoints like mortality or morbidity. Ex: Increased BNP is correlated with the extent of myocardial ischemia, age, renal insufficiency, and ventricular dysfunction in patients with acute coronary syndrome suggesting that BNP may be useful as a surrogate marker for multiple conventional risk factors. Indicate potentially harmful effects of a drug in cell-based or preclinical studies. 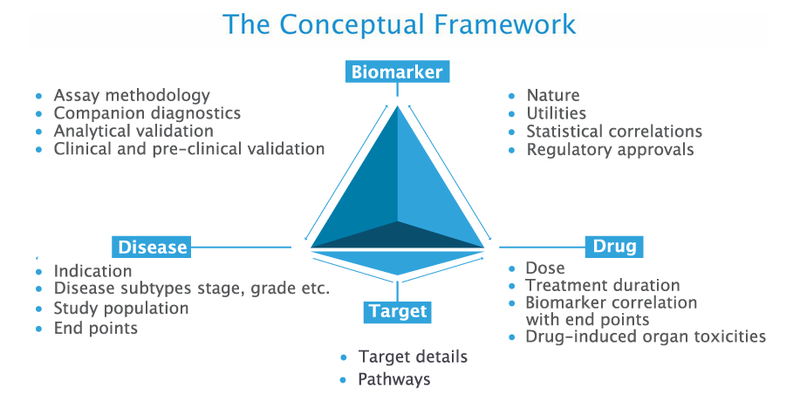 Biomarkers are classified based on the biomarker status (pre-clinical, exploratory & clinical), nature and technique used to measure a biomarker or by the chemical nature of the biomarker. Diverse utilities of biomarkers representing the utility of the biomarker from the author's perspective in the curated reference. Information on clinical trial design, biomarkers evaluated, clinical endpoints, sponsors and collaborators, phase of the study, study population, ethnicity details etc. Get custom alerts by therapeutic area and biomarker name of interest by subscribing to the custom alert service. 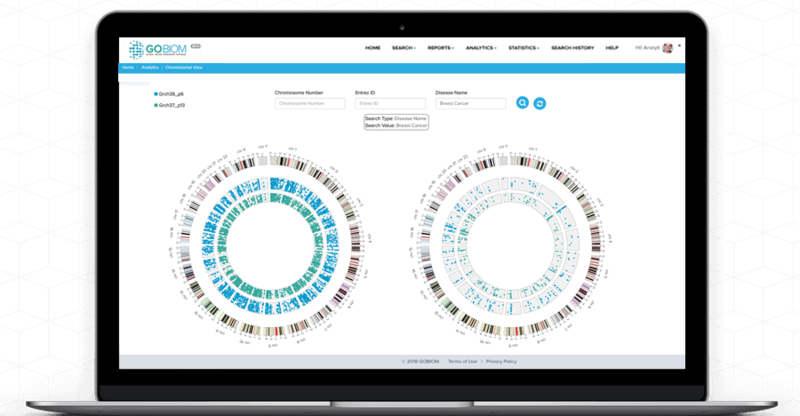 Avail our on-demand curation services for customized updation or addition of biomarkers of interest in the database. 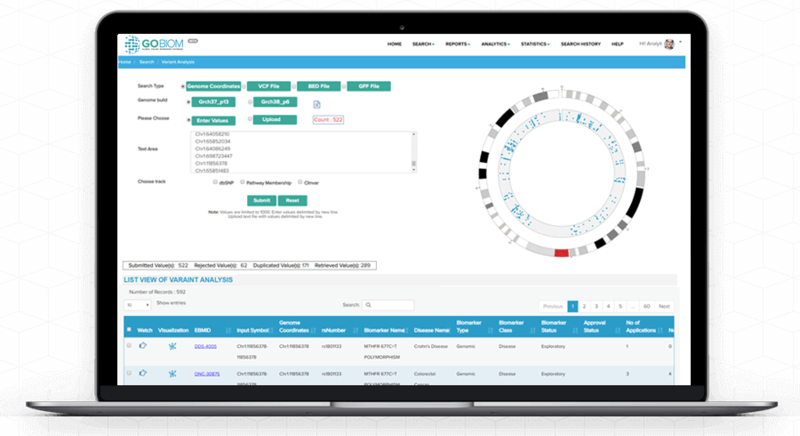 GOBIOM enables discovery biologists working on an indication to gain insights into proteins/genes targeted by drugs. Genes/proteins activated in the disease condition i.e. diagnostic biomarkers can serve as a therapeutic target enabling discovery of new drugs. GOBIOM can help companies involved in new drugs development to gain insights into probable use of the drug in other indications. 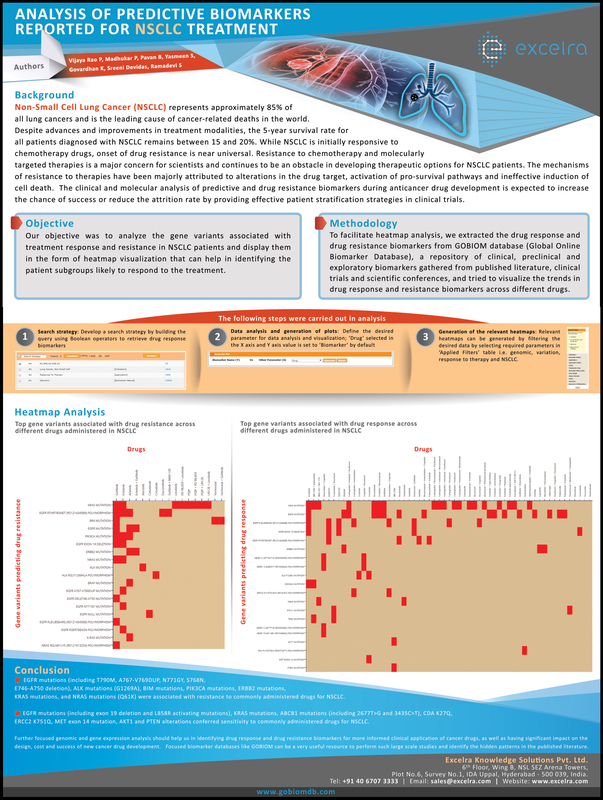 Analysis of Top 10 indications vis-a-vis number of biomarkers can provide insights into drug repositioning in indications other than which the drug is intended to use. GOBIOM BIOMARKER DATABASE: GOBIOM Biomarker Database is a comprehensive biomarker database that provides information on Proteomic, Genomic, Biochemical, Imaging, Metabolite, Clinical Scoring scales and Cellular biomarkers for 18 different therapeutic areas, covering ~2900 therapeutic indications with its reported utilities like diagnosis, prognosis, monitoring disease progression, treatment response, surrogate, efficacy and toxicity. 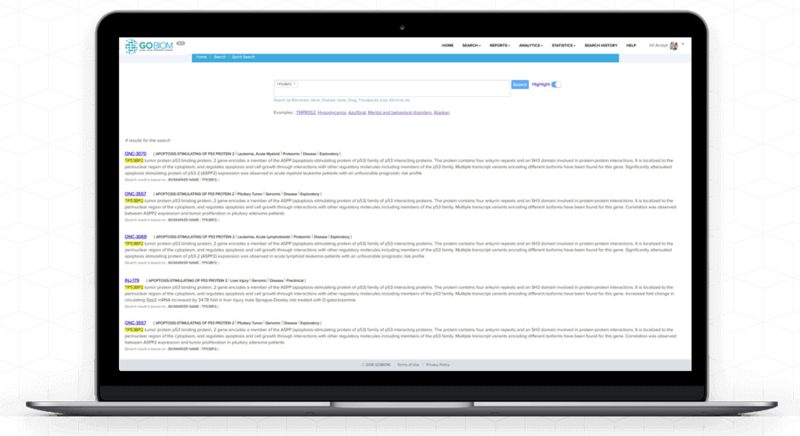 Information in GOBIOM biomarker database is gathered from diverse sources which include clinical trials, scientific conferences, regulatory-approved documents, literature databases etc. A proprietary Tetrahedron model is adopted in the framework of the database to simplify the process of biomarker data analysis. Our Biology services spans across custom curation, Bio-IT and Data Analytics providing solutions for targeted literature curation, vocabulary management, data mining, database development & integration, data harmonization, & Visualization. 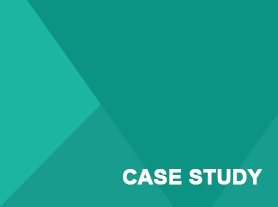 Our curation services reduce the time and costs required towards drug development R&D and achieve better outcomes. 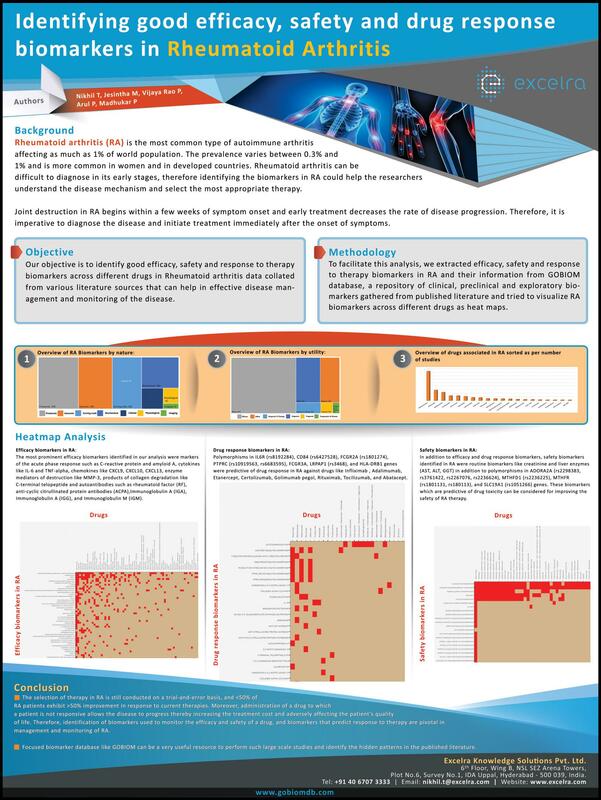 Outcomes successfully delivered include actionable mutations for targeted therapy, Clinical genome variant interpretation & reporting, Gene set enrichment analysis & pathway analysis, Text mining & analysis of clinical trial data, Gene annotation & ontology mapping, Phenotype reporting & outcome mapping, Biological process annotation of proteins, Multiomics data integration & analysis, and Off-label use of approved drugs. Farkas H, Veszeli N, Kajdácsi E, Cervenak L, Varga L.
Carragher NO1, Brunton VG, Frame MC. Chen R, Sigdel TK, Li L, Kambham N, Dudley JT, Hsieh SC, Klassen RB, Chen A, Caohuu T, Morgan AA, Valantine HA, Khush KK, Sarwal MM, Butte AJ. GVK Biosciences (GVK BIO) today announced that it is extending its Clinical Biomarker Database (GOBIOM) license to the Biomarker Qualification Group of the US Food and Drug Administration (USFDA). 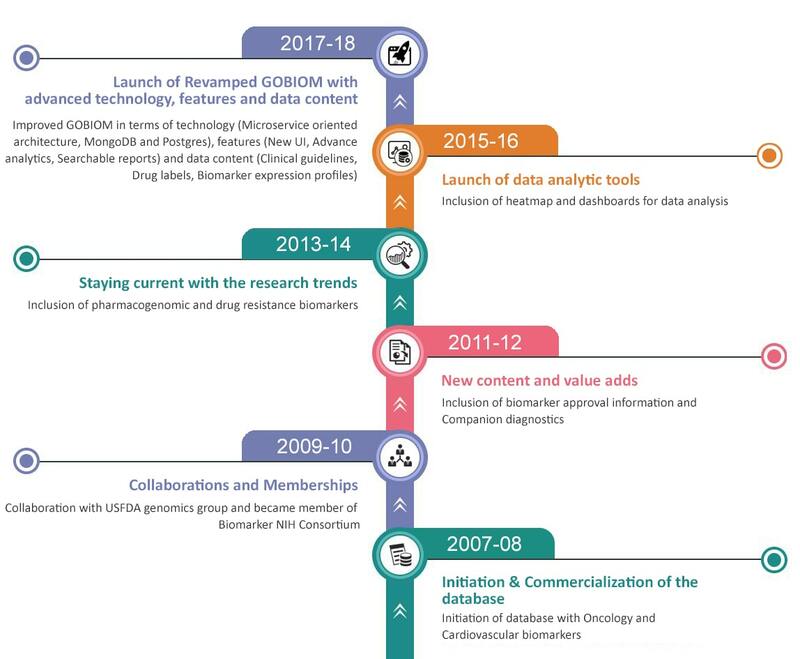 The GOBIOM database, which has the latest and recently updated information on all the biomarkers reported in various clinical and preclinical studies, will be beneficial to the USFDA in its Biomarker Qualification Process. GVK Biosciences (GVK BIO), Asia's leading contract research organization announced today that it has licensed its popular clinical biomarker database (GOBIOM) to the prestigious Division of Cancer Prevention (DCP), National Cancer Institute (NCI). In an agreement facilitated by the Indiana Economic Development Corporation (IEDC) during a February economic mission to India, the Indiana Clinical and Translational Sciences Institute (CTSI) has partnered with GVK Biosciences, Asia's leading Contract Research Organization, to provide researchers across the United States access to GVK BIO's Clinical Biomarker Database that will advance research on wide range of diseases. The Indiana CTSI Bioinformatics Core and Indiana Institute for Personalized Medicine will work together to manage the process by which researchers access this new resource. GVK Biosciences (GVK BIO), Asia's leading drug discovery research and development organization, announced today a new partnership with the PROOF Centre of Excellence, focusing on biomarker development for heart, lung and kidney failure. GOBIOM (Global Online Biomarker Database) is an online scientific database product of Excelra Knowledge Solutions Pvt. Ltd. 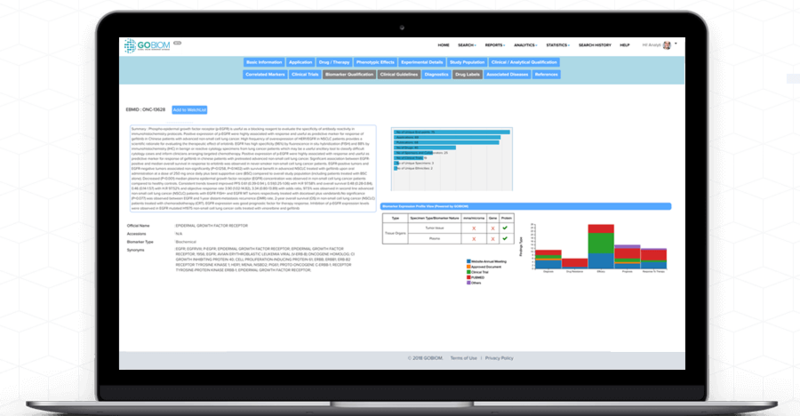 The database is a comprehensive collection of all the clinically evaluated and preclinical biomarkers associated with different therapeutic areas reported in global clinical trials and other scientific literature. 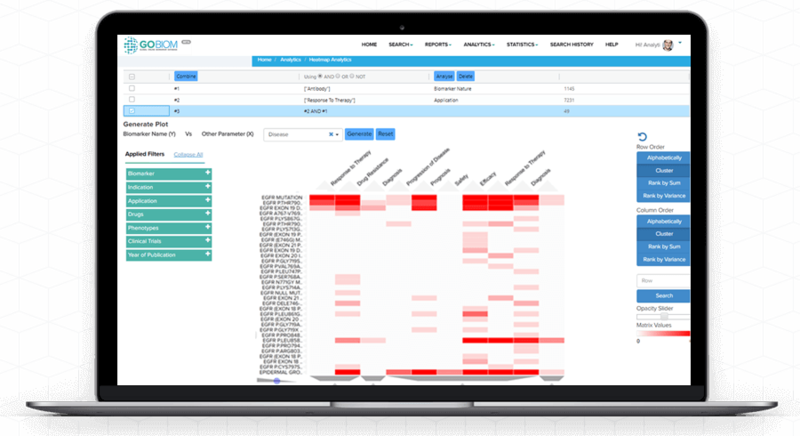 GOBIOM has information on Biochemical, Genomic, Proteomic, Imaging and Metabolite markers with 340 data points for each marker covering its clinical as well as preclinical qualification. All data entries are hyperlinked to the Reference. What is your selection criteria for a biomarker? The official NIH definition of a biomarker is: "a characteristic that is objectively measured and evaluated as an indicator of normal biologic processes, pathogenic processes, or pharmacologic responses to a therapeutic intervention." We go through all the clinical trials, published literature and scientific conferences to look at the studies where at least a single biomarker is measured. We developed ontology dictionary for the biomarker keyword, which is used to screen the literature. What are your Literature sources? What is the source of ontologies, taxonomies? Does GOBIOM have controlled vocabulary? What are the export formats? GOBIOM UI enables user to export data in MS Excel, XML and PDF formats. Frequency of updates to web and dump? For every 15 days GOBIOM online data is updated. Data feed is provided monthly, quarterly or annually according to the client's need. Do you send custom alerts when the database is updated? For every data update an automatic email will be sent to users by GOBIOM application. Enhancements in application will be updated to user and a training session will be conducted to train users on new features. How can a user customize alerts? 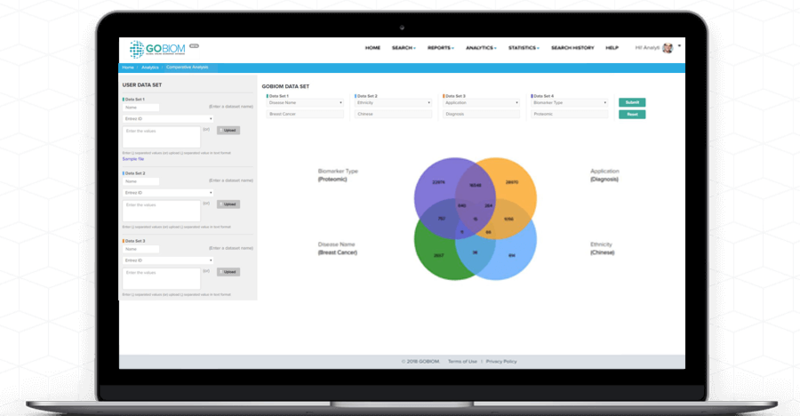 User can set-up alerts on specific Therapeutic class, Nature, Biomarker and Disease name. User will receive email whenever data gets updated on those parameters. Is it possible to provide the data in custom format? Yes, data will be delivered in the client specified format. GOBIOM data can be customized according to the client need. Will you help us in integrating GOBIOM with our internal databases? Yes, GOBIOM team will help in integration of data with internal databases according to customer need. 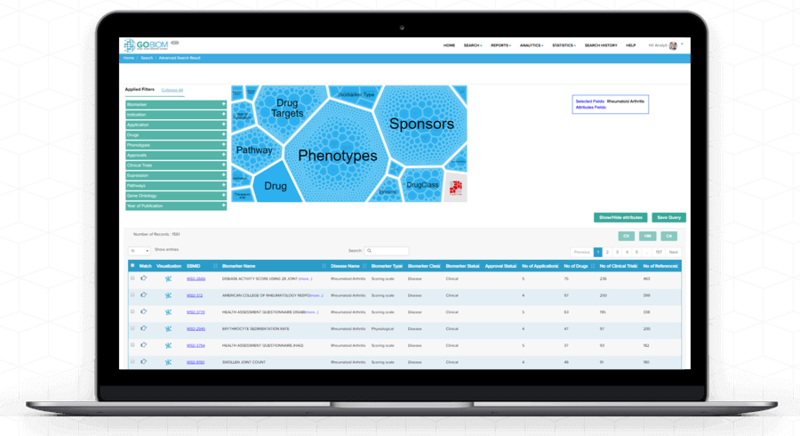 GOBIOM data can be easily integrated because it contains many public identifiers for Protein, Gene, Drug and Disease etc. How do you identify latest information on biomarkers? Can I evaluate the database before taking a decision? What are the external databases to which GOBIOM is connected? GOBIOM is cross linked with well-known publicly available databases like NCBI PubMed, Gene, KEGG Pathways, PubChem, Clinicaltrial.gov, Scientific conference web sites, Patent database, WHO ICD-10 database, ChemID Plus etc. Does my browser support GOBIOM application? How to send feedback on the database? We would love to hear from you. Just click on the feedback link and submit your feedback. If you forget your password, click on 'Forgot Password' option in the login page. Enter your email address/user name in the text box provided to receive your new password. What should I do if I do not receive my 'Forgot Password' email? You can change your password by clicking the 'My account' link after logging in. Select the 'change password' option to change your password. It is not possible to change your username once you've signed up for GOBIOM account. We maintain a record of all the user details. If you no longer have the email sent to you with username and password. You can recover your username by contacting the support team. Your username will be sent to you via email. I'm having trouble loading the site? I have a problem not described here? Why I am not able to receive email alerts I have subscribed to? Several factors can prevent you from receiving GOBIOM email.